The multi-billion dollar agreement between Pakistan and China to develop the port of Gwadar does not present a very promising picture for the people of Gwadar, still living in atrocious conditions amid serious security threats. Gwadar is one of the most generously endowed areas in the region thanks to a 790-km coastal belt as well as a wealth of mineral reserves. However, this wealth is not reflected in the lives of its local people. Gwadar’s coastline, located on the shores of the Arabian Sea, is important to the shipping route into and out of the Persian Gulf. The government of Pakistan formally awarded a multi-billion dollar contract for the construction and operation of Gwadar port to China last year, aiming to improve the port and open the doors of development and prosperity for Pakistan, particularly Balochistan. Meanwhile, residents of this small area are still struggling with a lack of basic necessities, such as clean drinking water and health facilities. Even as poverty and unemployment remain rife, the area has witnessed an upsurge in religious extremism in Gwadar, which recently saw a private school principal who had established a modern school gunned down. For many in the region, there has been no visible effort by Pakistan’s government to reduce unemployment or alleviate poverty. According to official statistics, Gwadar is among the worst performing districts – if not the worst – in the areas covered by the Millennium Development Goals (MDGs). The residents of Pakistan’s port city are even deprived of most important human resource: water. The city has been facing an extreme water shortage for decades, attributable to a lack of planning. Syed Essa Noori, leader of the Balochistan National Party Mengal (BNP M) in Gwadar and an elected member of Pakistan’s national assembly, has criticized the government of Pakistan and rejected mega projects like Gwadar port. In circumstances where people are compelled to drink contaminated water, he believes that in the name of development, Islamabad wants to make the majority Baloch people a minority in their own homeland. “Being a resident of Gwadar I see this mega project as a conspiracy against the people of Gwadar,” Noori said, adding that by building the Gwadar port, the rulers were seeking to bring thousands of people from Punjab and other areas into Gwadar in order to convert the Baloch into a minority. Noori claims that Balochs in Karachi lead miserable lives and are deprived of rights and jobs – and that this would also be the fate of the locals in Gwadar if they are turned into a minority as they were in Karachi. He says the people and leaders of Gwadar had been ignored time and again by Islamabad. “Only the people of Gwadar have a right over their resources in the area, but they were not even consulted before the project was launched,” he told The Diplomat. Noori asserted that the people of Gwadar are being denied jobs at the port, as even laborers are brought in from Sindh, Punjab and other parts of Pakistan. He emphasized the political and economic injustices the residents of Gwadar face and vowed to continue his struggle using all available forums. And Essa Noori is not alone – many from Gwadar are against the project, viewing it as a conspiracy. The Balochistan National Party-Mengal (BNP-M), the Baloch National Front (BNF), the Baloch Republican Party, and militant organizations like the Balochistan Liberation Front, the Balochistan Liberation Army, and the Baloch Republican Army are among those that oppose the deal with China. Allah Nazar Baloch, whose militant organization the Balochistan Liberation Front is active in Gwadar, has been warning multinational companies and China to halt investment in Gwadar port. Baloch has called Chinese investment in Gwadar fake and argued that China is only after its own interests. In his most recent statement, he warned multinational companies not to waste their money on contracts with Pakistan to explore and plunder resources in Balochistan, claiming that he would not allow that to happen. Indeed, on several occasions already, Chinese engineers have been targeted for attack by the BLF in Balochistan. However, the Islamabad Policy Research Institute (IPRI), an Islamabad-based research institute, argues that Gwadar port could be a game changer. 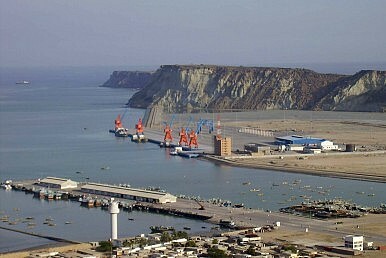 According to the IPRI, this port could serve as an economic hub for Balochistan, Pakistan, and the region. In fact, Fazal Ur Rehman, the executive director of the Pakistan Council on China, argues that Gwadar itself would become an economic hub of development for Balochistan. He says it would open doors to development for many economic and social sectors in the province. Analysts believe that once Gwadar port is fully developed and functional, it could be a gateway to the Strait of Hormuz. This would enable it to compete with UAE ports, improving existing links with the Caspian region and offering a better trade route to the landlocked region. However, according to one key government official, the United States – worried about the growing Chinese presence in the area – has several times tried to pressure the government of Pakistan into not handing the port over to China. Now, New Delhi is planning to develop Iran’s Chabahar port just a few miles away from Gwadar Port. The port of Chabahar in southeast Iran is central to India’s efforts to open up a route to landlocked Afghanistan, circumventing Pakistan. However, experts say Gwadar Port, once developed and functioning well, will be capable of creating a nexus between Pakistan, China and Central Asian countries that will generate billions of dollars in revenue with its short route. According to the government of Balochistan, as part of the China-Pakistan Economic Corridor, Beijing also plans to connect Gwadar to China with road, rail and fiber links to enhance trade between the two countries. Jan Mohammad Bluedai, a spokesperson for the government of Balochistan, says that oil and gas pipelines will also be part of the corridor in the long run, benefiting economic activity in Balochistan. However, the economic corridor is unlikely to be successful without the backing of Baloch insurgents and nationalist leaders, who have been opposing – and sometimes even attacking – Chinese engineers working on the port. Nationalists are vehemently opposed to Gwadar port, arguing that the Baloch do not want mega projects but sovereign autonomy so that they can control their own local resources. If Pakistan is really intent on developing the port, Islamabad will need to convince locals that it will actually benefit them. As long as their living conditions remain dire, that will remain a challenging task. Kiyya Baloch is a freelance journalist who reports for the leading Pakistani English newspaper Daily Times in Balochistan and other outlets on foreign affairs and the insurgency, militancy and sectarian violence in Balochistan. The Plight of the Gwadar FishermanIndia Doubles Down on Chabahar GambitReturn From a Pakistan DungeonTrouble at the Pakistan-Iran BorderIs China Influencing Pakistan’s Elections?